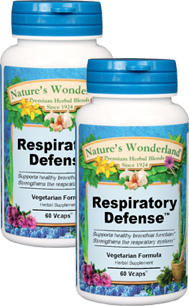 Respiratory Defense™ - 525 mg, 60 Veg Capsules each (Nature's Wonderland) - Penn Herb Co. Ltd.
Elecampane…respiratory tonic relaxes air passages to promote clear breathing. Irish Moss…soothing seaweed supports healthy bronchial and lung functions. Anise, Licorice…the sweet root and spice herb soothe the throat and respiratory system. Supports healthy lung and bronchial function; provides soothing support for mucus tissue, such as the throat and respiratory system; supports healthy bronchial passages. As an addition to the daily diet, take 1 or 2 capsules, three daily with water at mealtimes. SEE LABEL FACTS BOX FOR CAUTIONS.